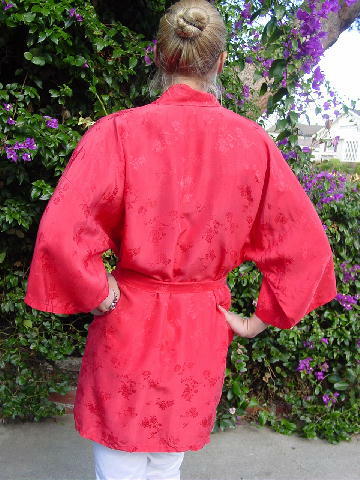 This vintage 100% silk short robe is by Longevity and was made in Hanszhou, China. It's in a dark peachy-watermelon color with 2 open front lower pockets. 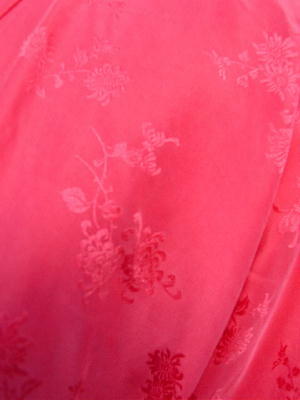 There is a tone-on-tone floral pattern. It has belt loops and a 67" long by 1 3/4" wide fabric matching tie belt. It was a gift from her aunt who had been a model. shoulder to shoulder 28 1/2"